The Brook Super Converter series makes old controllers compatible with new consoles. This particular model, the Xbox 360 to PS4 Controller Adapter, lets you use Xbox 360 controllers such as gamepads, dancemats, joysticks and racing wheels with PS4 game consoles and PS4 on PC. This not only saves you money but also means that you can use the controllers you have grown accustomed to. Installation and use of the Xbox 360 to PS4 Controller Adapter is effortless. 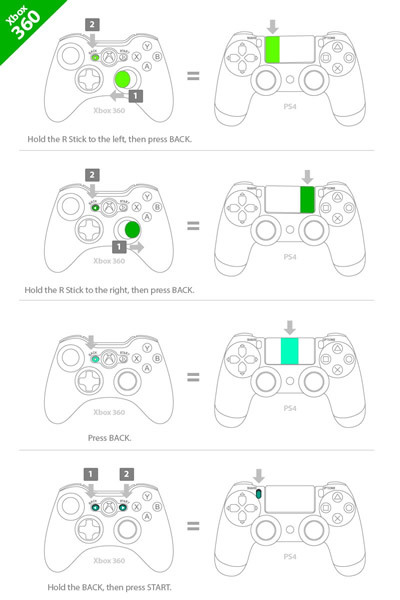 Xbox 360 controller: Use the "Back" button and the R stick to simulate the touchpad button. 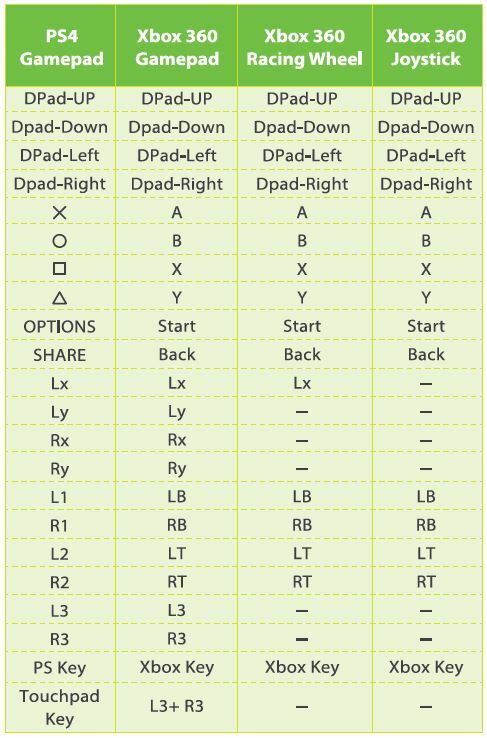 Xbox 360 controller: Use the “Back” button and the “Start” button to simulate the “SHARE” button. The Brook Controller Adapter recognizes Xbox 360 controllers and Xbox 360 steering wheels and automatically configures all buttons as shown in the map bellow. No switching is required. * Each Brook Controller Adapter can only handle one Xbox 360 controller at a time. * Xbox 360 controllers connect to the Controller Adaptor automatically, but must be connected with a USB cable at first time use for the purpose of registering the controller. * For use with a PC running on Windows 7 please install the original Xbox One driver from Microsoft. Older operating systems are not supported. For anyone wondering, input lag is so small as to be completely un-noticeable (0.7 frames). I have seen no dropped inputs but I haven't had it for too long. I find this with my xbox SFxT madcatz fightstick to be far better than the Venom PS4 stick I was using, even though it was all replaced with sanwa parts. If anything, it might actually be a little more responsive, even when it's a converter on PS4. Plug it in, plug your 360 peripheral, play. The end. Got this converter to use with SFV as I only have 360 fight sticks and it works great. The only thing is you have to turn off the auto sleep function on your controllers otherwise the converted controller will stop responding after the allotted time. As far as latency goes it's barely noticeable and as far as I can tell it's not negatively effecting move execution on SFV. Perfect ! Arcadeworlduk wins ! Bought from France. Very fast delivery.